This document will familiarize you with ways to navigate, access and refresh web pages. To follow a link, click on it. Most links are colored and underlined, but any time you move your cursor over something and it becomes a pointing hand, it is a link. The Location bar at the top of the window shows the URL (web page address) of the site you're viewing. Tip: To change a URL, no need to highlight the entire previous address. Usually clicking once anywhere in the URL will auto-select it and you can begin typing in another address immediately. Tip: You don't always need to enter the prefix "http://www." for URLs. Notice the address in the second image. The two links depicted take you to the same place. If a web page did not load correctly or completely, or if the content of a page may have changed, click the Reload button to refresh the contents of that page. To navigate backwards through visited web pages, click the left arrow. If you back up too far, click the right arrow to move forward. 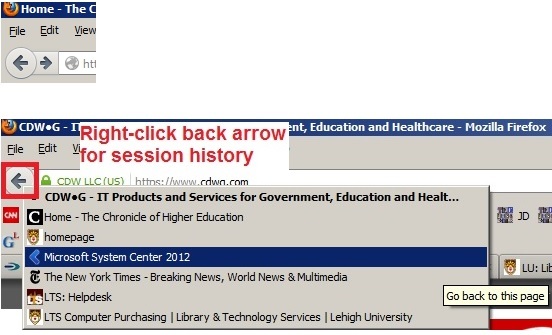 To back up or go forward more than one step, right-click the back or forward button to see a history of sites visited. Click a site from the list.